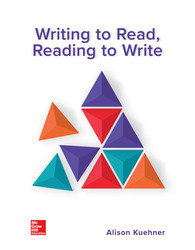 Writing to Read, Reading to Write presents reading, writing, and critical thinking as engaging and complementary endeavors. This focus on reading also gives students who are underprepared for the first-year composition course, or in the co-requisite support sections, a chance to practice those skills and re-apply them as they develop college level work. Theme: Do Social Media Connect Us—Or Isolate Us? Theme: What Makes Us Happy? Theme: Can Head Injuries Be Prevented in Sports?